Using an expert computer system to parse through over three million satellite photos, scientists have compiled a high resolution map of the Earth that’s offering an unprecedented glimpse into how our planet’s surface water has changed over the past three decades. This new mapping effort was led by Jean-François Pekel from the European Commission’s Joint Research Centre in Ispra, Italy. Recorded at a resolution of 100 x 100 feet (30 x 30 meters), the new maps show the planet’s water surfaces (excluding oceans) in astonishing detail. What’s more, it tracks changes in features like rivers, lakes, and wetlands over the course of 30 years. 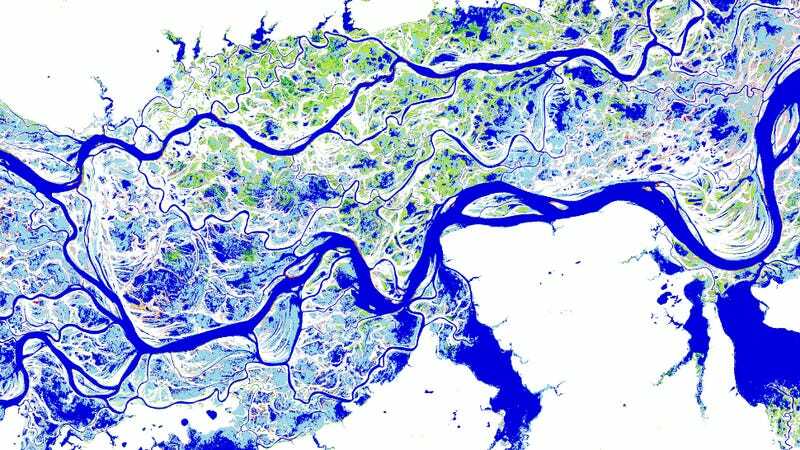 Using these maps, scientists can now study how surface waters are changing over time, and how human activities are reshaping the planet. Earlier attempts to map our planet’s surface waters lacked the required resolution. They were too fuzzy to discern smaller lakes and rivers—a huge limitation given that millions of lakes less than one square kilometer in size account for roughly 40 percent of the global area of inland water. Previous satellite surveys, the best of which featured a resolution of 820 x 820 feet (250 x 250 meters), made it difficult for geologists to discern surface water from ground; the color of water varies greatly depending on depth, presence of sediments and dissolved chemicals, and the angle at which the sunlight hits the surface. For the new survey, Pekel’s team sought to create a truly global and methodologically consistent measurement of changes in surface water over time. Indeed, our planet’s water surfaces are constantly shifting, owing to natural process like flooding, sedimentation, and channel migration, and due to human activities like the construction of dams, reservoirs, and water extraction. To say this was a meticulous survey would be a gross understatement. The researchers analyzed 3,066,102 Landsat images taken at monthly intervals between 1984 and 2015. To handle all this data—1.8 terabytes to be exact—and to distinguish terrestrial land features from water, the researchers utilized an expert computer system and the processing power of the Google Earth Engine platform. Using this system, the researchers were able to classify each pixel (representing a 100 x 100 foot block) of each image as being either water, land, or a non-valid observation. The resulting 32-year record of our planet’s water history was then used to produce a set of sortable maps that document different facets of surface water dynamics. These maps have revealed some fascinating changes over a relatively short period of time. Collectively, permanent surface water has disappeared from an area measuring almost 35,000 square miles (90,000 square kilometers) since 1984—roughly equivalent to Lake Superior. Around 70 percent of surface water losses occurred in just five Middle Eastern countries, Kazakhstan, Uzbekistan, Iran, Iraq, and Afghanistan. This illustrates the tremendous water management challenges in this region, including drought.